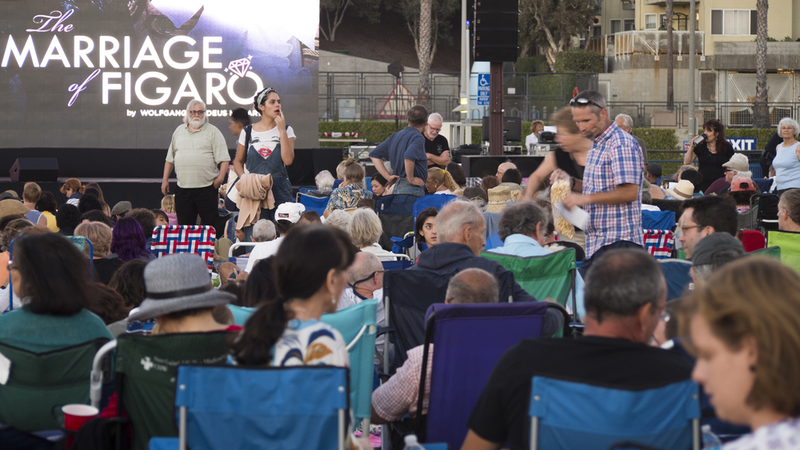 The LA Opera's first semi-annual Opera on the Beach kicked off last Wednesday evening. Their premier show of La Traviata, performed at the Dorothy Chandler Pavilion was livestreamed to a big screen on the Santa Monic Pier. It was a full beach with picnics, wine and beautiful music. Beaches and picnics aren't the first things to come to mind when I think of going to the opera, but in an effort to make opera more accessible to the public, the LA Opera opened doors with a stunning performance of La Traviata for free ($1 processing fee to reserve tickets online). The Italian opera included projected English subtitles. The whole event went surprisingly smooth, with doors opening around 6:30PM. I arrived around 5:30 and managed to be within the first 15 people in line. I arrived just in time, because around 6:00 the line was wrapping around the corner and down the pier. It was great to see so many people show up for the performance. There were students, families and opera attendee veterans. Everyone was on a different level but at no point unwelcome. The pier had an excited and lively atmosphere. Picnics were as simple as homemade sandwiches to fancy wine and restaurant takeout. The wooden boards of the pier made me grateful for my small beach chair and blanket. 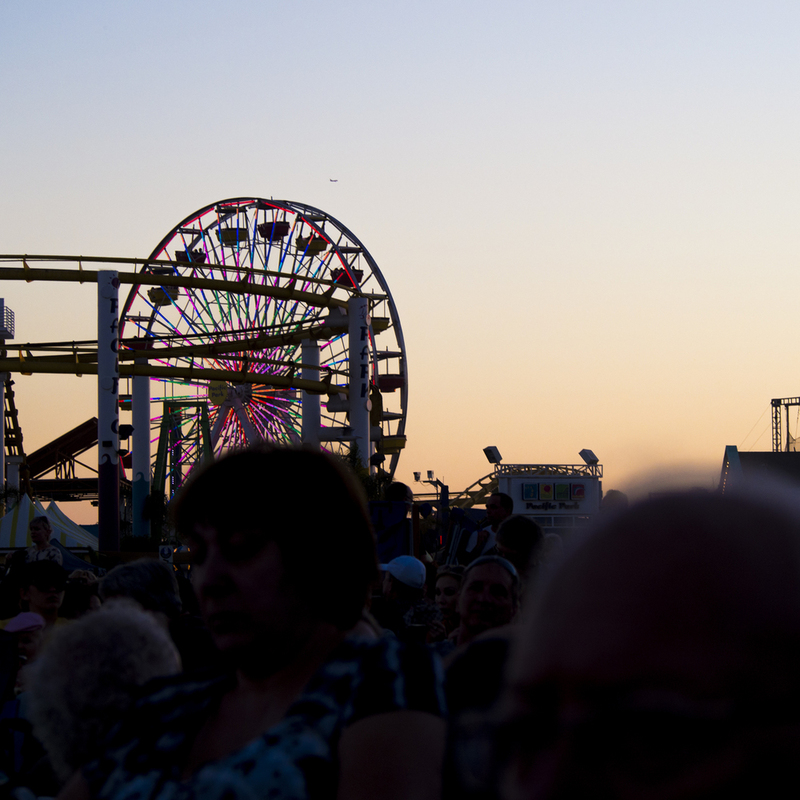 The weather was perfect and the sunset framed the evening just as the overture began to play. The performance was great, although La Traviata is not one of my favorite operas. Violetta's tendency to wallow in self pity and overall whiny attitude is hard to bare for three unrelenting hours, however, Nino Machaidze's Violetta carried a controlled yet bold soprano voice and Arturo Chacón-Cruz had a sweetness in both voice and expression that really fit with the love-struck Alfredo. Plácido Domingo as Giorgio Germont, Alfredo's father, was a fan favorite, with applause and cheers as he swaggered on stage. Overall it was a quality event with the class of traditional opera and the relaxed atmosphere of the California beach. The two worlds came together for an evening of unbiased music, and hopefully a few new opera enthusiasts were born. I'm excited to see what show the LA Opera chooses for the 2015 semi-annual Opera on the Beach. La Traviata continues to be performed at the Dorothy Chandler Pavilion with tickets available on LA Opera's website. Violetta throws a party attended by her wealthy lover Baron Douphol and her friends, including Flora, a courtesan like Violetta. Gastone introduces Violetta to Alfredo Germont, a young man who tells her that he is one of her greatest admirers. Violetta welcomes Alfredo to her gathering. Gastone invites Alfredo to offer a drinking song, and Alfredo sings the praises of wine and the love it inspires. Violetta joins him, urging everyone to enjoy the fleeting pleasures of love and life. As the guests move into the ballroom, Violetta has a sudden attack of faintness, an unwelcome reminder of her declining health. Alfredo urges her to abandon her exhausting way of life. He tells her that he has loved her since he first saw her. Violetta tactfully suggests that she is not the kind of woman he should fall deeply in love with; nonetheless, she invites Alfredo to visit her again. When her guests have left, Violetta muses over his declarations of love. Disturbed to discover that her own emotions have been deeply stirred, she resolves to forget Alfredo and continue devoting herself to the shallow pleasures of the courtesan’s world. Alfredo has been living for three months with Violetta in her country house. He is ashamed to discover that she has been secretly selling her possessions to meet their expenses. Alone, Violetta receives a letter from Flora, inviting her to a party in Paris. An unexpected visitor arrives: Giorgio Germont, Alfredo’s father. Germont asks her for a great sacrifice; his daughter’s marriage prospects have been threatened by Alfredo’s scandalous association with Violetta. Germont convinces her that leaving Alfredo would be the most generous, selfless thing she could do for him. Violetta knows that because she is mortally ill, any future happiness is unlikely without Alfredo. She writes two letters: the first is an acceptance of Flora’s invitation; the second is addressed to Alfredo. When Alfredo returns, Violetta attempts to hide her great agitation. Desperately assuring him of her love, she goes off in a carriage to Paris. Alone, Alfredo reads Violetta’s letter, which informs him that she is returning to Baron Douphol. Germont returns to console his son. Alfredo sees Flora’s invitation and, unaware of Violetta’s sacrifice, vows to avenge himself for her apparent faithlessness at Flora’s party. That evening, Flora’s guests are entertained by masqueraders dressed as gypsies and matadors. Alfredo arrives, alone; Violetta enters shortly afterward with Baron Douphol. Alfredo goes to the card table, where he is soon joined by the Baron, but Alfredo’s good luck at gambling is unmatched. When the guests sit down to supper, Violetta privately begs Alfredo to leave. Furious, he insults her in front of everyone, throwing his winnings at her as “payment” for their time together. The elder Germont comes in, joining the assembled crowd in expressing their outrage. Violetta is near death, alone and impoverished. Germont has written to tell her that Alfredo, who had fled abroad after wounding Baron Douphol in a duel, has been told of Violetta’s sacrifice and is on his way back to Paris. When he returns, the lovers are reunited with tender words. Giorgio Germont also arrives, filled with remorse, but there is nothing to be done. Violetta feels a sudden rush of exhilaration as her pain disappears, and she dies.